On Wednesday, January 26th, activists from Animal Destiny held an event from 2:30 pm to 4:30 pm. 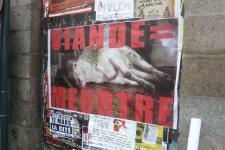 The action consisted in handing out leaflets against speciesism and sticking "Meat = Murder" posters around the city center. We met two vegetarian people; one showed interest in joining the group.